Dungeons and Dragons was first published in 1974, by Tactical Studies Rules Inc.(TSR). It became the best-known and the best-selling role-playing board game. There are now scores if not hundreds of role-playing games available on the World Wide Web. Many of these are free to play, although some have extra features available that have to be paid for. In most cases the game requires that a small computer program (known as the client) be downloaded and run on the player's computer. Some games however can be run in a browser, without downloading anything. 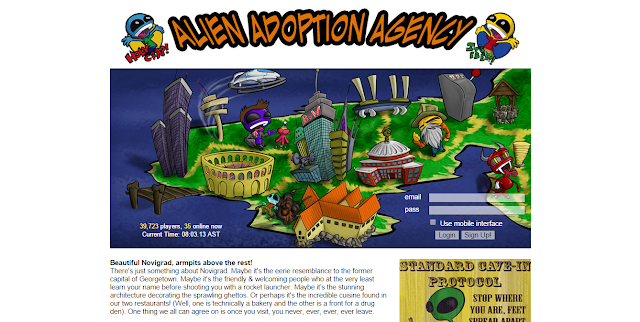 An example of this is Alien Adoption Agency. (AAA) This has been running since 1997, and has a large and active community of players. Unlike many online games it involves no combat. The object of the game is to adopt an alien and to nurture it, guiding it to maturity. Taking care of the alien involves making it study and work. The more it is educated, the higher is its earning potential. There is also an opportunity to provide it with a life partner. Free accounts can be created, or a subscription account. A significant part of the game is the community aspect: it is not really suitable for only solo play. It is also geared towards the teenage audience. One of the dominant themes of online roleplaying games is that of combat. In many games there is an opportunity to battle monsters, and often an opportunity to engage in combat against fellow players. Battle of Phantasia is an example of a combat game. It allows players to create characters and explore the realm, fighting any evil they may encounter. Characters make progress through experience from fighting monsters and/or other players. They can also progress by attaining positions of power, such as king or queen. The highest position of power is Valar. In many games there is an emphasis on community activities, with players being encouraged to band together to complete tasks. One such is Cronous. This is an action RPG, and progress through various experience levels is achieved by defeating evil characters and by completing quests. Players can also learn skills, up to 30 per character. A strong element of the game is the community aspect. Some games are designed such that the game can be extended and built upon by the players themselves. One example is Daimonim which is a 2D Fantasy Community. Players can help to create the game as well as play it, applying for roles such as developer, artist, musician, etc. Inside the game the player is a fearless hero together with many others in a large, persistent fantasy universe. Dark Eden is an example of an attempt to create a fantasy world with unusual characters. In this game the player can choose to be a vampire, slayer or ouster. Each is a distinct race, with its own skills and classes. At night the vampires are relatively stronger, while in daytime the slayers and ousters are more powerful. Vampires can use about 40 different skills and magic. Ousters can muster about 70, while slayers can have up to 100. Sometimes a game is designed with the individual adventurer in mind. An example of this is Deicide. In this game the player becomes the hero(heroine) of a mythical novel, featuring spacious landscapes and also dungeons. RPGs have developed enormously from the early days when all adventure games were text-based. Now each fantasy world is replete with elaborate artwork and often with detailed combat systems. They are indeed dangerously enticing.